Don’t assume that since you are a buyer, you just have to pay tax to seller and that’s all. 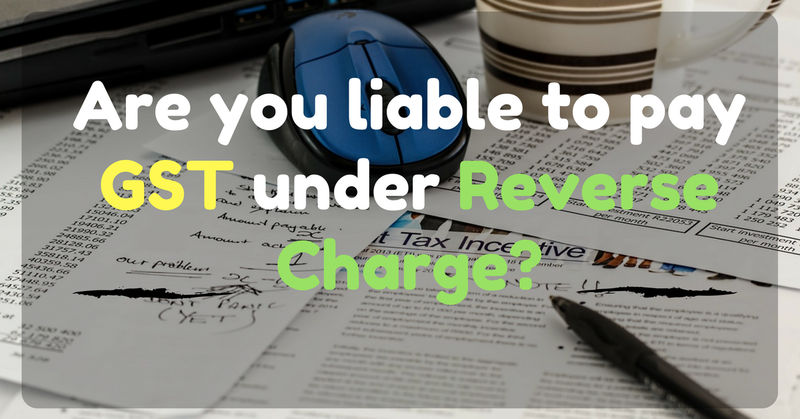 It is very much possible that you could be liable to pay tax to the government directly, under the concept called reverse charge. Few might argue that this is not a new concept as it exists under service tax law in present indirect tax regime and they are well versed with it. then why? Because GST applies the reverse charge concept on goods too. Even in case of services, the concept would be applicable not just in case of notified services but others too. We are there to help you and this article provides you all the needed information on reverse charge mechanism under GST. Every business has to ensure that its suppliers of both goods and services, are paying the right amount of taxes on time, to allow seamless flow of input tax credit. In some situations, this is accomplished through the reverse charge mechanism. How does it work? The liability to pay tax to the government is usually on the supplier. But, when this liability get “reversed” and the recipient is charged with liability to pay tax to the government, the concept of reverse charge emerges. Suppose A provides service to B for INR 100,000. He charges GST (assumed rate 18%) of INR 18,000. In this case, B will pay INR 118,000 to A and A will deposit GST amount of INR 18,000 to the government. This is the usual case called forward charge. The liability to pay tax is on recipient of supply under reverse charge. 1. Unregistered person supplying taxable goods or services or both to a registered person. a. Taxable goods or services or both supplied by a registered person to a registered or unregistered person is covered under forward charge provided such goods or services are not notified for reverse charge. GST council in its 14th meeting has recommended 12 services on which tax shall be payable under reverse charge basis. These services are yet to be notified. The list is attached as Appendix 1 at the end of the article. b. Taxable or exempt goods or services or both supplied by an unregistered person to another unregistered person is not liable to tax and hence question of reverse charge does not arise. d. Exempt supplies by an unregistered person to a registered person are not covered under reverse charge. Here, we would like to highlight that as per section 9(5) of CGST Act, for some services yet to be notified, electronic commerce operator is liable to pay tax as supplier if such services are supplied through it. Technically, this cannot be called as reverse charge as per se definition of reverse charge, the liability to pay tax is on recipient of supply and not supplier or deemed supplier. So, Please be mindful of this while using reverse charge supplies in computing different turnover limits or interpreting the provisions of the laws wherever the concept is used. Once you determine that you are covered under reverse charge, you need to know the provisions relating to registration, tax computation and payment. The forthcoming section highlights these procedural aspects relating to reverse charge. The person liable to pay tax under reverse charge has to compulsorily get registered under GST irrespective of turnover being less than threshold limit. So, even if your turnover is less than INR 20 lacs, you will have to obtain registration under GST if you are liable to pay tax under reverse charge. In case of a taxable supply by an unregistered person to a registered person, the recipient shall issue an invoice in respect of goods or services or both received by him from the supplier on the date of receipt of goods or services or both. Also, he shall issue a payment voucher at the time of making payment to the supplier. For this, we need to determine the time of supply in case of reverse charge as specified under Section 12 of CGST Act. To illustrate, suppose sales made by A (unregistered) to B (registered) for INR 50,000. The invoice was issued on May 29, goods were received by B on June 1, and payment cheque was given by B on June 8, received by A on June 9 and cleared on June 10. Since A is unregistered person supplying goods to a registered person B, the supply qualifies for payment of tax on reverse charge basis. Hence, the time of supply is June 1. 3. The supply will form part of tax liability of the month of June. To illustrate, suppose accounting service provided by ABC (a small service provider and hence unregistered) to company B (registered) for INR 50,000. The invoice was issued on May 29, and payment cheque was given by B on June 8, received by ABC on June 9 and cleared on June 10. Since ABC is unregistered person supplying services to a registered person B, the supply qualifies for payment of tax on reverse charge basis. Hence, the time of supply is June 8. 3. The supply will form part of tax liability of month of June. In any case, time of supply in case of goods supplied under reverse charge will not exceed beyond 30 days from issue of invoice. In any case, time of supply in case of services supplied under reverse charge will not exceed beyond 60 days from issue of invoice. Please note that supplies under reverse charge will also attract GST Compensation Cess in applicable cases. Tax paid under reverse charge is available as input tax credit (ITC) to the registered recipient person subject to restrictions on ITC under GST law. Further, such recipient shall also not lose benefit of ITC availed even if payment to supplier is not made within 180 days of issue of invoice, in view of specific exclusion provided in Section 16. Recipient of supply will have to file return. What happens to the ITC attributable to supplies covered under reverse charge, from the perspective of supplier? Suppose, A is engaged in supplying goods and services. One category of the services he supplies are covered under reverse charge. In this case, we know that the inward supplies are used for effecting both supply of goods and services including reverse charge supplies. Can he take credit of entire tax paid on inward supplies (input tax credit)? An unregistered person is not entitled to benefit of any input tax credit as he is not liable to collect and pay tax. The tax paid on inward supplies, forms cost of the supplier. Here Section 17 of CGST Act comes into picture which provides the ITC apportionment rule. Exempt supplies are said to include supplies on which tax is payable on reverse charge and hence, where, supplies includes both taxable as well as exempt supplies, amount of ITC available shall be only that much input tax as is attributable to taxable supplies. Even the refund provisions does not cover such refund of tax paid on inward supplies relatable to reverse charge supplies, resulting in such tax forming cost of the supplier. We feel this position of law is not correct as the reverse charge supplies are technically not exempt supplies. Only the charge to discharge tax liability has shifted. Such input tax on inward supplies as is attributable to reverse charge in case of registered supplier should be allowed as refund. Therefore, the supplier, whether registered or unregistered, cannot take benefit of input tax attributable to reverse charge supplies. Composition scheme does not affect the liability of the supplier to pay tax under reverse charge mechanism. In case, he obtains supplies from an unregistered person or supplies that are notified so, he shall be liable to pay tax under reverse charge and that too, at the normal rate of tax. However, composition dealer may not able to claim ITC of the tax so paid as input tax does not include tax paid under composition levy. Time to go GST compliant and we are there to help you! Advance payments are also subject to reverse charge mechanism.